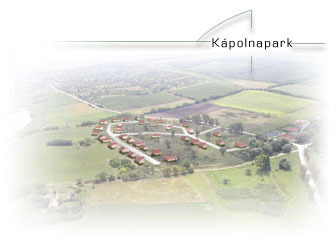 The Kápolnapark ('Chapel Park') residential area is in Bot-puszta, which is one of the most beautiful parts of Etyek, also a site of historical interest, in the vicinity of the Bot-Chapel and the Etyek fish-pond. Forty-two residential lots lie on the southern slope of the chapel-hill. Right at the entrance of the park, two more lots are available for building a service house catering for community needs. Our goal is to establish a residential zone in which it is possible to live and rest in a rural environment, maintaining traditional architecture, also meeting the requirements of modern life. From the southern slope of the park, there is a wonderful view of the village and the vine-hills surrounding it. The other side of the hill faces a picturesque lake, approachable by an esplanade. The village of 3700 lies twenty-six kilometers from Budapest, the capital city of the country, on the edge of the Zsámbék Basin, at the beginning of the Etyek hills, on the border of Pest and Fejér counties. The population is increasing year by year as the village is getting more and more popular within the agglomeration of Budapest. This reputation is greatly improved by the cultural programs organized now regularly and known all over the country (Wine festival, the 'Kezes-lábos' folk art festival), the Alexander Korda Film studio being built here as well as the wine cellars, developed through the centuries-long viticultural history of Etyek. 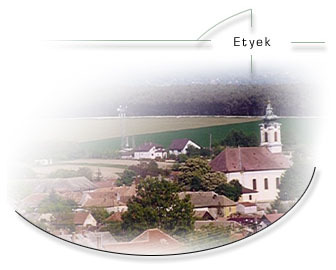 The grape produced in the village's area, one of the historical wine-growing regions of Hungary, is base of the Törley champagne made in Budafok, but the increasingly popular Etyek wines (Chardonnay, Sauvignon Blanc, Auvergnat Gris, Rhine Riesling) are also made of this grape. Settlements from the prehistoric age dating back to 9000 B.C. were found by the two historic sites of the village (Magyar kút, Kálvária-domb). There are several historic buildings in the village. The most widely known of these is [a 'Boti Kápolna' link]: Bot-Chapel. The high stone church and hermit's home is standing on the top of the hill of Bot-puszta, which used to be an independent village in the 13 th century A.D. The church and the hermit's home are popular with inhabitants of Etyek and visitors of the village alike. 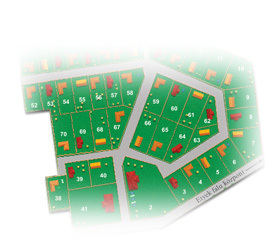 Our lots are far away from the noise of the city, yet close enough to Budapest, at a distance of 26 kilometers. From Budapest, the area is accessible by a beautiful alley of protected chestnut trees from highway No. M1 (Zsámbék exit), also from main road No. 1 (at the 24 th kilometer post) as well as through Biatorbágy. Public transportation is also available: buses run regularly from Etele square (Budapest 11 th district). A number of buses leaving from Széna square (Budapest 1 st district) also reach the village. There are special school buses serving Columbus Traveling Secondary School, which is located next to the area. The important hypermarkets are accessible in 10 minutes by car. Shopping can be done easily in the well-equipped 'CBA' store just being built in the village, too. The lots are on the southern slope of the chapel-hill. Their area is at least 1500 square meters, which ensures the appropriate living space for those in need of a quiet home. Your investment is certain to keep its value here!